Nestor, Samuel, me, Ana and Elizabeth. I’ve always felt that the great touring ensembles like the Símon Bolívar Orchestra of Venezuela, or the Youth Orchestra of the State of Bahia, Brazil, might be the most famous faces of the South American wave of symphonic music making, but not necessarily the most representative of its spirit – or its reality. The excellent, inspirational nature of their performances seems offset by the advancing age of the musicians (the Símon Bolívar is no longer billed as a “youth orchestra”), the expensive instruments, the international jet-setting, and the extraordinary government largess behind them. It’s a wonderful effect, but it’s not the cause; it’s the victory parade, not the struggle in the trenches. So if you want to light the Sistema fire anew in a world saturated with Youtube videos of Dudamel whipping through Bernstein’s Mambo, avoiding the repetitive conferences with the usual suspects, maybe you look to the people still in the trenches, the (actual) young, the good, and the metaphorically hungry for opportunity. You don’t need many, but you do need to give them a chance to be spectacular. And they’ll take it, of course. For a full week in Prince George, British Columbia, four young South American musicians dazzled incredibly diverse audiences. Certainly, the concert with the Prince George Symphony was a highlight: horn player Elizabeth Linares, age 18 from San Carlos, delivered the Saint-Saëns Morceau de Concerto virtually flawlessly in her solo début. Violinist Samuel Vargas, age 16 from Acarigua, also has his premiere performance as a soloist, nailing the Introduction and Rondo Capriccioso by the same composer. Both earned immediate standing ovations. They, along with violist Ana Paulin (Brazil-Salvador) and oboist Nestor Solorzano (Venezuela-Guanare) joined the ranks of PGSO in the second half for a selection of Latin American repertoire. Malambo, Danzon No. 2, Huapango, Tico-Tico…. The barn burners. And the barn burned. You can read the local review here. Yes, it really was like a rock concert. Both orchestra and visitors surpassed all expectations that night – even their own, I think. But there were other moments as significant and as dazzling, and perhaps even more meaningful. There were multiple performances in the schools for adoring crowds of children and salon concerts, but one particular event stands out in my mind: the performance at the downtown youth shelter, in front of the toughest audience imaginable. It isn’t enough to talk about a new world. You have to create it, and then invite people in. 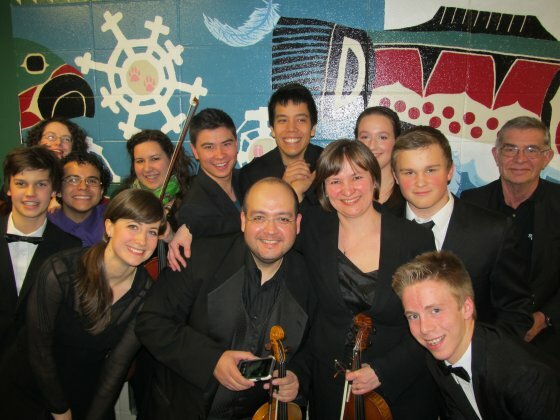 Over the course of the week, Ana, Elizabeth, Nestor and Samuel did just that, and if there were one thing that crowned their success, it was this email to me from José Delgado Guevara, the concertmaster of the PGSO. On a more personal note, thanks for the small conversation we had during the Salon. You asked me about El Sistema in Prince George, I did tell you then that we still did not have a Sistema inspired program yet, then you mention something about a catalyst and just go ahead and do it. That simple and short conversation did inspire me to put in motion a plan. This week I will have a series of meetings with the PGSO and the Quinson Elementary school in order to start a Sistema inspired program. We will star with a pilot program in September of 2013. 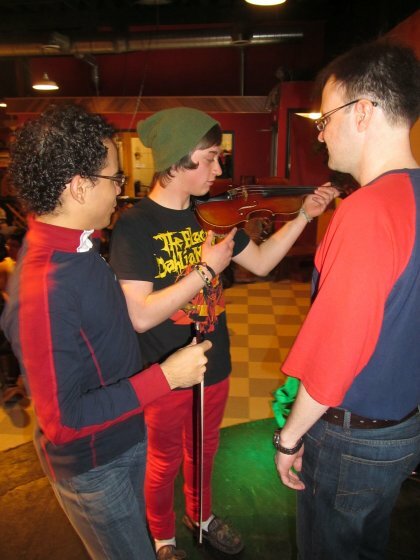 5 days a week violin group lessons taught by advance violin students from the Conservatory. These 5 students will meet once a week with me for lesson plans and pedagogical advice. When I asked José’s permission to reprint this letter on my blog, he readily assented, knowing that public disclosure would bind him irrevocably to action. If you can, please support him. José Antonio Abreu: “Nunca podré decir misión cumplida. Yo ando en un compromiso de vida”. It is a life commitment, but it’s also a joy. Thank you, Ana, Elizabeth, Nestor and Samuel. Need a fire lit? The contact form is here.